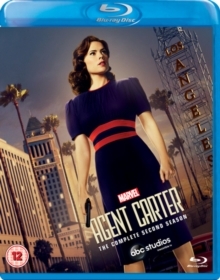 All ten episodes from the second season of the action adventure show starring Hayley Atwell as the Marvel Comics character Peggy Carter. Following the Second World War, Strategic Scientific Reserve (SSR) agent Peggy moves to Los Angeles intent on stopping new, atomic age threats to humanity. In this season, Peggy finds links to Isodyne Energy after a powerful new substance is discovered, which, in the wrong hands, could have potentially catastrophic results. The episodes are: 'The Lady in the Lake', 'A View in the Dark', 'Better Angels', 'Smoke and Mirrors', 'The Atomic Job', 'Life of the Party', 'Monsters', 'The Edge of Mystery', 'A Little Song and Dance' and 'Hollywood Ending'.